This video shows you how to swing wet flies for Steelhead. You'll learn the lines, leaders, flies and tactics needed to master swinging flies for Steelhead. Additional lessons include casting and fishing shooting heads. Jim Teeny is “the expert” when it comes to fishing shooting head and sinking lines for steelhead. He developed his own fly line company just for this purpose, and he knows what it takes to catch fish using these tools. How, where and why are the questions he will answer in this detailed instructional that shows you exactly how to get your fly in a steelhead’s face. All the gear is examined closely so you will grasp what is takes to be successful. Rods, reels, lines, flies, and leaders are explained and demonstrated. Jim takes you to the river and shows you how to fish and cast shooting head and sinking fly lines. 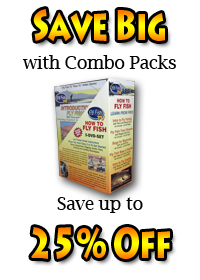 His concise and understandable lessons will allow you to grasp the tactics that will catch you more fish. Steelhead underwater are what you’ll see in this stunning video that covers all the elements and action of the “Teeny Technique”. How the fly line moves across the bottom of the river and how the flies run in the current help you visualize the principles of the system. It is a production filled with information and steelhead fighting sequences you won’t soon forget.